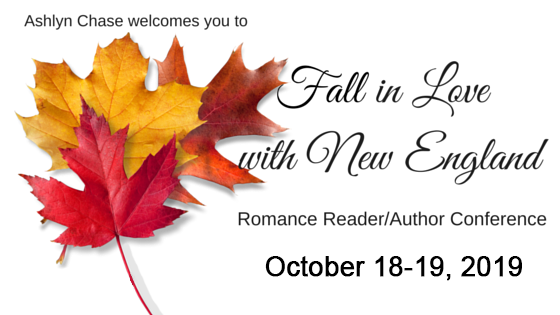 Fall in Love with New England Readers/Writers Conference! Going to reader/author conferences is always fun. If you are looking for one this October give Fall in Love with New England a look! In the great New England tradition, this conference was started as a grassroots endeavor. It's not part of any big organization or magazine, agency or publisher. We are simply romance authors who want to have fun with (and spoil) our wonderful readers! Ashlyn Chase established the basics back in 2016, and a lot of authors have contributed countless hours and ideas to make each new conference more superb than the one before it! Let's have tons of fun and make some new friends along the way! Mid-October is peak foliage season in New Hampshire. Rooms are $119+ per night (double queen or single king). You must book your own room at the Holiday Inn & Suites Nashua, NH. Call the hotel directly at 1-603-888-1551. When you call to make reservations, make sure you mention you are with Fall in Love with New England Readers/Writers Conference! If you have any questions, email ash@ashlynchase.com.